website. Here is what some of our past guests have said. this year to see the new things you have added. It was so scary even my boyfriend screamed. The Haunted Pyramids is a definite must see haunt for those who want to be scared! indoors, so even if it is raining this is a good haunt to come to. 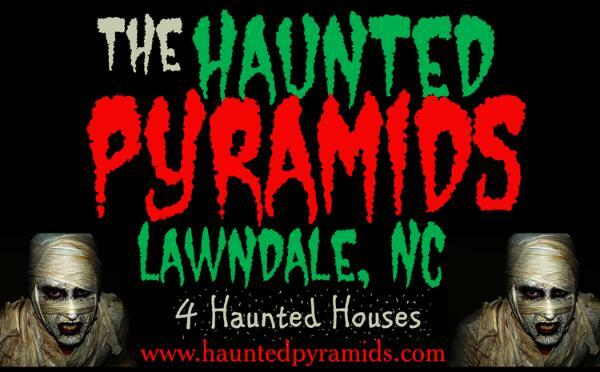 The Haunted Pyramids is the Scariest Haunt in North and South Carolina, hands down! really put lots of work in your haunted attraction. We look forward to coming every year! Pyramids. We hope to come down again this year! recommend it! We want to come again and again. AWESOME JOB! I could only go through one of the four Haunted Houses. It was called Monster Manor in 3D. It scared me so bad I had to wait and let my friends finish the other three Haunts without me. It was really a scary Haunted House to visit. We are from Canton. Ohio and was amazed. Scare factor - 5/5. Wow. This is a golden nugget tucked somewhere down a lonesome, winding, dark highway. set designer over the past 16 years is evident in every inch of their incredible construction and high-impact delivery. (literally) to make us one of them. The 3D Clown house is creepy, disturbing, and made me feel drunk all over again. thoroughly intimidated. Characters were realistic and intensely connected to constantly flowing scare blows our way. gurgles)...it's all there inside these houses. house maze. A maze design that takes groups as long as 18 minutes to find their way out of? That's seriously scary. minutes. The Asylum and Clown houses were both about 10 minutes each. But, it was worth every minute of waiting. you can print $2 off coupons from their site in addition to the handful of special discount nights at $15 per person. show I am about to experience.